Balangoda is a large town in Ratnapura District, Sabaragamuwa Province, Sri Lanka, governed by an urban council located 143 kilometres (89 mi) away from Colombo and 43 kilometres (27 mi) from Ratnapura on Colombo - Batticaloa Highway(A4). It is one of the largest towns of the Sabaragamuwa Province. According to the 2001 census, Balangoda has a population of 16,875 and area of 16.2 km2 (4,000 acres). The Hominini, or hominins, form a taxonomic tribe of the subfamily Homininae ("hominines"). Hominini includes the genus Homo (humans), but excludes the genus Gorilla (gorillas). As of 2019, there is no consensus on whether it should include the genus Pan, the question being closely tied to the complex speciation process connecting humans and chimpanzees and the development of bipedalism in proto-humans. Balangoda is situated in the hilly central region of central Sri Lanka on Sabaragamuwa Mountain Range. The main livelihoods of this region are farming (vegetables, fruits, and spices), rice cultivation for mainly local consumption, tea cultivation for international markets as a commercial crop and gem mining. Sri Shariputhra Maha Vidyalaya is a secondary school in Imbulpe, Balangoda, Sabaragamuwa Province, Sri Lanka. It was established in the 19th century. At present, more than 800 students are studying at the college.According to ancient documents, it was the first school in balangoda education zone. Many politicians, lawyers, scholars, physicians,engineers,and other government officers studied at this college. Government graduated teachers and other education college's teachers conduct the class for student up to G.C.E.(A/L). Normally,1st or 2nd level government education service officer is appointed as the principal of the college. there are Buddhist and Roman Catholic educational backgrounds .Also according to the department of education, students of the college follow the local syllabus and face to a/l and o/l examinations which are conducted by government of Sri Lanka. According to the history of the college, it was established as boy's college however after 1950's it was converted into the mixed school by the government .Also according to the official document and students roll of the college founded principal of the college was Mr. Silva and the first student was Mr. Appusincho. Also, the college has more than 15 acres premise in Madagedaragoda, Imbulpe .college conduct their science and computer laboratory class in the full facilitated laboratory .one of the laboratories was a present of Hon. Srimao Bandaranayake in 1975. Balangoda Ananda Maitreya Thero was a Sri Lankan scholar Buddhist monk and a personality of Theravada Buddhism in the twentieth century. He was highly respected by Sri Lankan Buddhists, who believe that he achieved a higher level of spiritual development through meditation. Sri Lankan Buddhists also considered Balangoda Ananda Maitreya Thero as a Bodhisattva, who will attain Buddhahood in a future life. Talduwe Ratugama Rallage Weris Singho, better known as Talduwe Somarama Thero, shot and killed S. W. R. D. Bandaranaike, the fourth Prime Minister of Ceylon, who served from 1956 until his assassination by Somarama in 1959. Pavithra Wanniarachchi is a politician and lawyer by profession. In 1990 Hon. Pavithra Wanniarachchi entered politics on the invitation of the then Prime Minister Mrs. Sirimavo Bandaranayake who was the world’s first woman Prime Minister. In 1991 she was appointed as the chief organizer for Kalawana. She then became a member of the Sabaragamuwa Provincial Council in 1993 and in 1994 she entered Parliament as an MP representing the Ratnapura District. Sirimavo Bandaranaike Vidyalaya is one of the leading Public Girls schools in Colombo, Sri Lanka. It is a National public school controlled by the central government, provide primary and secondary education. Alexander Perera Jayasuriya was Ceylonese politician. He was a former Minister of Health, Senator & Member of Parliament. He was one of the founders of the Sri Lanka Freedom Party. 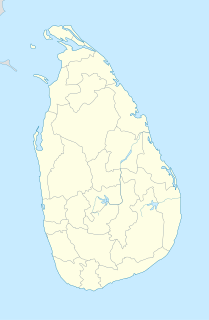 The 1966 alleged Ceylonese coup d'état attempt was an alleged military coup planned in Sri Lanka (Ceylon). The commander of the army and several military personal were arrested. They were later acquitted of a plot to overthrow the legally elected government. Barnes Ratwatte was a Ceylonese colonial-era legislator and a headman. He was a member of the State Council and the Senate of Ceylon. He was appointed to the posts of Rate Mahatmaya of Balangoda and Dissawa by the British. He was the father of Sirimavo Bandaranaike, the first female Prime Minister in the world. Clifford Senaka Ratwatte was a Sri Lankan politician. He was a former Parliamentary Secretary to the Minister of Agriculture, Food, Co-operatives and Fisheries in 1964 Member of Parliament for Balangoda, Chairman of the State Plantations Corporation and the Sri Lanka Tea Board. William Ellawala was a Ceylonese legislator. He was the Kandyan Sinhalese member of the Legislative Council of Ceylon. He was appointed to the post of Rate Mahatmaya by the British Government of Ceylon. Horagolla Walauwa is a large bungalow in Atthanagalla, Western Province, Sri Lanka. S. W. R. D. Bandaranaike, the forth Prime Minister of Ceylon, was assassinated by the Buddhist priest Talduwe Somarama Thero on September 25, 1959, while meeting the public at his private residence, Tintagel at Rosmead Place in Colombo. Shot in the chest, abdomen and hand, Bandaranaike died the following day at Merchant's Ward of the Colombo General Hospital. He was the first Sri Lankan national leader to be assassinated, which led to his widow Sirima Ratwatte Dias Bandaranaike becoming the world's first female Prime Minister. ↑ Deraniyagala, Siran U. (1996). "Pre- and Protohistoric settlement in Sri Lanka". Congress of the International Union for Prehistoric and Protohistoric Sciences . 5 (16): 277–285. ↑ Fernando, Thilak (24 September 1994). "Face to face with late Ven. Aggamaha Panditha Balangoda Ananda Maitreya Thero". The Island - Saturday Magazine. Retrieved 4 May 2010. ↑ "Sirimavo Bandaranaike: First woman premier". BBC News. 10 October 2000.